Honor your employees with this colorful trophy! The Rainbow Pyramid Acrylic Award is an eye-catching award. 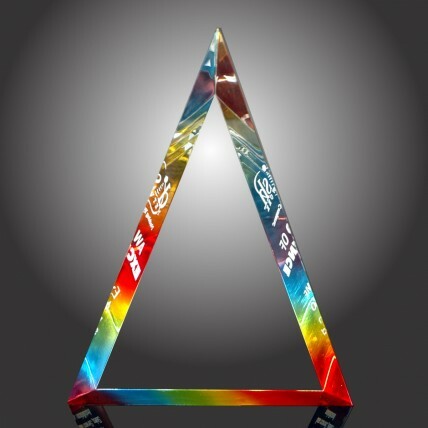 This clear triangular acrylic piece has a rainbow colored bottom that radiates color on the two beveled edges. Your engraving and logo will shine surrounded by all of the brilliant color. Choose from 4 sizes; all are laser engraved to yield frosted white letters. Small: 8.5", Medium: 9.5", Large: 10.25", XLarge: 12"
Small: 2.5"x2", Medium: 3.5"x2.5", Large: 4"x3", XLarge: 5.5"x4"